"Chapter 4 - Low Ping Rate"
One strip out of each chapter, the 'Seraphim Check', is my responsibility. It's not much, but I like to think it gives Piro a tiny mental break. I struggled to come up with an idea for this one throughout the entire chapter. I had nothing. It took me eight months to come up with this one strip idea. One strip out of close to 100. Not to sound too self deprecating, like Piro, but this strip isn't even that good. I'm not sure MT readers will even get the Julia Roberts montage joke from 'Pretty Woman' and 'Sleeping with the Enemy'. The only thing that saves it is Piro's art. Piro is very meticulous and even researched the proper kimono style an unmarried girl wears. I obviously think Piro is the greatest and I am his number one fan ever, but now I really appreciate what he does. Piro and I had a fantastic time at Sakuracon. We had some trouble getting out to Seattle. I ended up getting a complete and thorough frisk down in Minneapolis. Take my advice and don't wear a western shirt with metal snaps or jeans with rivets when going through airport security. I swear the metal detector was picking up the iron in my blood. Once we got to the plane we found out we were sitting in different rows. Piro ended up next to a baby. It was an adorable baby. It only cried and screamed during take off, landing, and flying. The Sakuracon guys must be the sweetest in the business. It was my birthday while I was there and they got me beautiful tulips and had all the guests sign my birthday card. I didn't even have to wait in line for hours for the signatures (evil laugh). I actually feel sorry for the guest relations staff assigned to Piro. One hour scheduled autograph sessions turn into 3 or 4 hour marathon signings. Saturday evening Piro signed for 4 hours and we missed Cosplay. During that signing the fire alarms went off - not one person got out of line. No one even flinched. It turned out to be a false alarm but next time there is a potential emergency, please, at least look around for an exit and consider leaving the building. 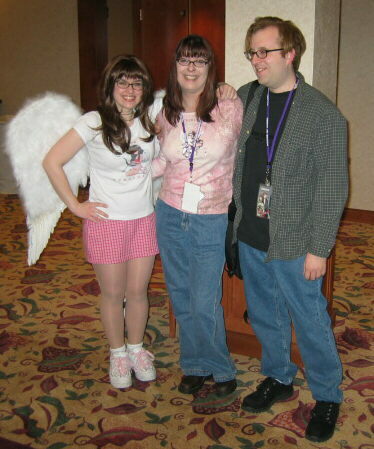 I also met Lauren who has the dubious honor of being the first Seraphim cosplayer that we know of. She looks more like the comic Seraphim than I do. She's definitely much closer in height to the comic character than I am. I was hunched down in the picture. What is it with cons and snow? We came back to a snow and ice storm in Michigan. At least I'm positive that Anime Central will be snow free. Piro and I also had great time at the St. Joseph County Public Library Open Book Festival. About a hundred fans showed up. Two girls got one of their Moms to drive them five hours to see Piro. That meant they left at 6:00 am. What a great mom. The rant pic at the top was a fan art done by Willow, a five year old up and coming artist. I just love it. As a librarian-to-be I love the fact we lured MT fans into a library. Libraries can be pretty cool places. Public libraries are even slowly accepting the graphic novel as a legitimate genre. I am on vacation this week and hope to help Piro get new merchandise going, set up a calendar of his appearances, and if it is humanly possible, organize his studio. What am I doing? We are going on two years since we took time off - no MT, no computers, no phones... I should be at the beach! "Wa ha ha na ha"
Anyway. They've gone and done it. Announced in today's Dengeki G's was Bistro Cupid 2, the sequel to the ever-so-strange dating/cooking/role-playing game from Success and Firedog. This time they've assembled another respectable voice cast and given the characters another pack of goofy names (Celery Periwinkle is a personal favorite)... and it's coming out for the PS2 AND the Xbox, which leads me to say "Wa ha ha ha ha!". It comes out this summer, so look for a full review some time after I get the game.